I didn’t plan on writing a new post this morning. But there’s just too much bike news we need to share today. And who needs sleep anyway? Weshigh shares video of a driver who dangerously buzzed him on Venice Blvd after he signaled to move into the traffic lane. And apparently didn’t care. 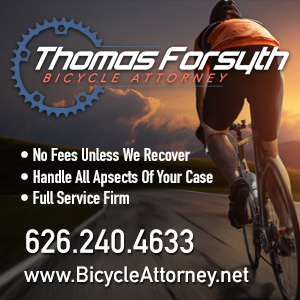 Ohio bike lawyer Steve Magas forwards dashcam video of a cyclist nailed in a left cross. He reports the driver had a stop sign, while the rider faced an uncontrolled intersection with the right-of-way. Fortunately, the rider is relatively okay, suffering a broken ankle in the crash. And he’s got a good lawyer. 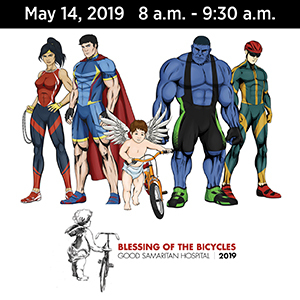 Streetsblog celebrates the opening of the new protected bike lanes on Los Angeles Street, while KNBC-4 talks with BikinginLA sponsor Josh Cohen about the new bicycle traffic lights. LADOT explains how the new protected lane works, including the new two-stage left turn bike boxes. But so much for the hope that the protected lanes would keep cops from parking in it. The Hollywood Reporter stages a three-way Starbucks to Starbucks race from DTLA to Santa Monica by car, train and ebike. Needless to say, the Expo train to the coast finished last, but surprisingly, the car beat the ebike rider by four minutes. The leader of the group of nine Kalamazoo cyclists run down by an out-of-control driver last week turns the other cheek, saying she has no ill will towards the man who killed five of her friends while wounding herself and three others. Los Angeles Magazine says a proposed new NoHo development includes an elevated cycle track through the property. Richard Risemberg says road diets don’t impede emergency vehicles, but the lack of them does. 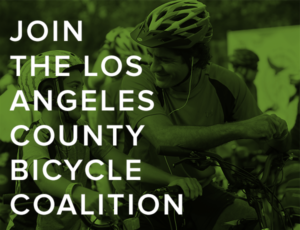 KPCC looks at LADOT’s hiring of sound artist Alan Nakagawa to work on Vision Zero. Burbank approves stop signs, and possibly bike lanes, on Edison Blvd despite the reservations of one councilmember over whether bike lanes would improve safety. Maybe he could look at some of the many studies showing just that next time. County supervisors Shiela Kuehl and Hilda Solis call for more parks in LA County. San Bernardino sheriff’s deputies are looking for a Montclair man who allegedly stabbed another man several times in a dispute over a bicycle. It’s an effing bicycle, for chrissake. It’s not worth trying to kill someone over. Here’s your chance to go on a 50 mile bike ride with Kawasaki motorcycle racers at the famed Laguna Seca raceway. Any East Bay bike riders who haven’t licensed their bikes are probably breaking the law. Nice piece from bike scribe Peter Flax — the ebike rider in the above mention race from DTLA to the coast — about the peace that comes from riding a century in wine country. Surly may have some problems, but the popular bike maker isn’t going under. Instead of fixing a dangerous intersection, Denver authorities say bikes shouldn’t even be there — despite a sign saying just the opposite. Two cyclists participating in Colorado’s Ride the Rockies pause along the nation’s highest continuous paved road in Rocky Mountain National Park to spread their father’s ashes; their dad had participated in the ride 18 times himself. This is the cost of traffic violence, as a San Antonio mother mourns the loss of her 15-year old son in a bicycling collision. Thanks to Steve Katz for the heads-up. Now that’s more like it. An Iowa drunk driver gets 34 years in prison — yes, 34 — for the death of a cyclist; he was already barred from driving for a previous DUI conviction, and had another eight misdemeanor drug and traffic convictions in just 16 months before the fatal crash. With good behavior, he could see his kids again in another 17 and a half years. What the hell is wrong with Michigan drivers these days? A hit-and-run driver faces 15 years for running down a bike rider on a charity ride after allegedly snorting coke, huffing and inhaling nitrous oxide. A Michigan sheriff says he only stopped a bike rider and cussed him out because he was worried the “road-raging” rider may have been clipped by a driver who flipped him off. Sure, let’s go with that. I want to be like him when I grow up. An Ohio cyclist is still winning bike races at 92 years old. A Rhode Island man “borrowed” a bike to get home, but was so drunk he couldn’t remember where he left it. Caught on video: Apparently, a New York bike lane is just a way for drivers to get around traffic. Caught on video 2: A motorist, a bike rider and an unidentified woman come to blows in a three-way brawl on a New York street for undisclosed reasons. A road-raging Maryland cyclist smacked a driver in the face with his U-lock; of course, judging by the article, the driver did absolutely nothing to provoke it. Seriously, no matter what a driver does, never resort to violence. If this rider is found, he could face a charge of aggravated battery, with a potential jail time measured in years, not months. NPR looks at how Atlanta’s architecture can make the city friendlier to bike riders. A group of African American cyclists embarked on a three-day ride from New Orleans’ Congo Square to AfricaTown in Mobile, Alabama. Mexican researchers develop phosphorescent cement that could allow bikeways to glow in the dark to improve safety. A Vancouver bicyclist calls for cyclists to show more courtesy to others on the streets. And says the same goes for drivers. New suicide barriers dangerously narrow a bikeway on an Edmonton bridge. A Toronto website lists the many condescending anti-bike statements from the city’s councilors, such as we’re dangerous psychos who cause anxiety among those poor, innocent drivers. Well, okay then. A new British bike taillight flashes brighter when you ride through hazardous situations, crowdsources road data, sends an alert if someone tries to steal your bike and texts your next of kin if you wipeout. A UK paper lists ten lesser known benefits of bicycling. All of which are pretty well-known to anyone who rides. No, Dublin, a ghost bike is a memorial, not an abandoned bicycle. Probably not the best idea to hitch a ride by grabbing ahold of a speeding English tram. If you’re carrying dope and a loaded handgun on your bike, put a damn light on it. No, seriously, put a damn light on your bike if you’re planning to use it as your getaway vehicle after burglarizing some homes. And we only have to worry about dodging tourists on the bike path, not a bear darting into your path. From a technical point of view it’s probably possible for an LADOT officer to issue a parking ticket to an LAPD officer. However, in the real world doing so would probably subject the LADOT officer to unending and vicious harassment. Mike is right. I have seen police cars ticketed by LADOT, but not often, most likely for exactly the reason Mike gives. On the other hand, back when Sgt. 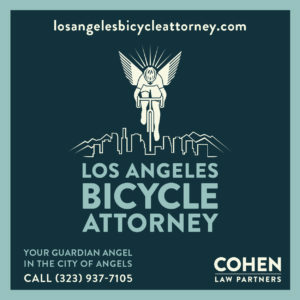 Krumer was bike liaison for the LAPD, he offered his advice on how to handle the situation.